Large beautiful house with swing and terrace. Sunny and quiet location. Magnificent view of the mountains. The house was completely renovated in 2009. Modern tasteful furnishing with all comfort. It is very suitable for families with children. 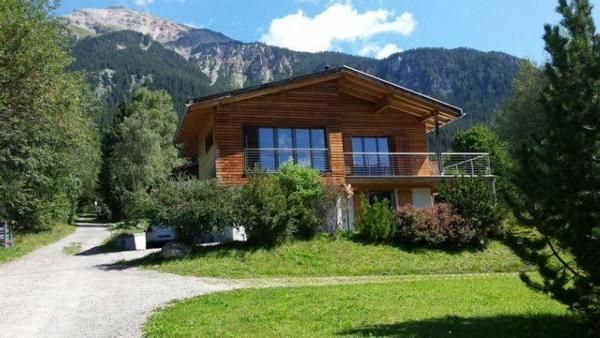 2 minutes from the cottage in Lenz it has a small ski lift, very suitable for beginners and families with small children. Cellar for ski and boot room and suitcase available. Parking for up to three cars. If necessary, a mattress can be added in a room for an extra person or child. Post bus station and ski bus: Sudem Vischnanca / Lenz Unterdorf 5 min. From the house. Grocery VOLG with post office in the village. Children's ski lift, children's ski school etc. minutes from the house. Cross-country ski trail from Biathlonarena in the upper part of the village of Lantsch / Lenz. Winter hiking trails and versatile ski resort Lenzerheide / Arosa with artificial ice rink, toboggan runs, ski school, etc. in winter. Cultural Opportunities. Thermal bath Alvaneu. Also in spring, summer and autumn there are wonderful opportunities for hiking, swimming and biking, as well as numerous other sports: 18-hole golf course near St. Cassian. In Heidsee (Lenzerheide) you can swim and surf. Beautiful public playgrounds in Lenz and Lenzerheide. Gorgeous hiking area. Mountain railways. Well signaled hiking and mountain trails, bike trails, picnic areas u. S. W.
The two-storey holiday home is suitable for large families and smaller groups. On the lower floor are three bedrooms 2 with double bed 1 with loft bed (for the loft bed it has a grid). A bathroom with shower. The upper floor has a bedroom with a double bed and a bathroom with shower / bath / WC. Bed linen and towels available, TV, Fondue set, Dishwasher, Hairdryer, Coffee machine (Nesspresso), Raclette set, Radio, Swedish stove, Terrace. Baby bed without blankets. - Final cleaning: once per object costs in the amount of 160 CHF (optional). - Local tax / tourist tax: per person and day costs of 2. 6 CHF (obligatory). - Children's tax: per person and day costs of 1. 3 CHF (compulsory).